An indoor fountain will bring many of the desired benefits, offered by the ancient philosophy known as Feng Shui, but it is very important to note that its proper placement is crucial for the success in acquiring those benefits. There is a Feng Shui Bagua map which is used to chart out the home, room or office, and it must be properly aligned over those facilities to analyze where the specific energies are located. The map has different regions, each dedicated to different life sectors, family, career, wealth and much more, and installing a water feature in a wrong location can be more harmful, than beneficial. The location of the fountain determined with the Bagua map is also important because with placing the fountain in a particular area of the room you may be blocking the energies of the other elements present in the room, and smother their positive influences. This should also be considered when deciding the fountain placement. It is good to know that, according to Feng Shui, water close to the main entrance of a home or office building, no matter the position of the compass and the points, attracts success and wealth. Placing a wall fountain in the entrance hall, or an outdoor model in front of the main door is certainly good decision if this is what you aim for. Aside the fountain placement, if you want to attract the positive energies into the home or office, you can also consider buying a water feature that has the corresponding symbols or images, such as bamboo or fish, lotus blooms or stones, etc. 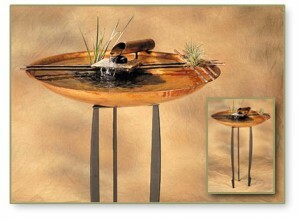 Shop tabletop fountains today at Serenity Health and find the perfect element to bring into your home.